The Monuments of Oviedo and the Kingdom of the Asturias are six pre-Romanesque constructions all dating from the 9th century. 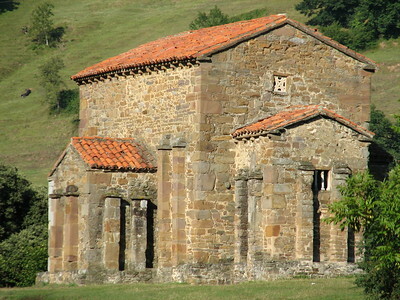 At that time, Asturias was a stronghold of Christianity. 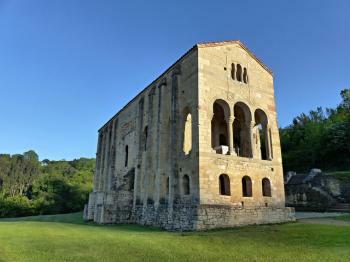 A distinctive and innovative pre-Romanesque architectural style developed in this isolated region north of the Cantabrian mountains. I had chosen "Oviedo" as the short title for this WHS, but digging more into the subject of this nomination I realized that that is misleading. The City of Oviedo isn't on the World Heritage List, although Spain tried it in 1998. It got rejected: ICOMOS does not consider the historic centre of Oviedo per se to be of World Heritage quality. This WHS is all about a few surviving 9th century monuments, the best examples of the Asturian pre-Romanesque architecture. The original nomination (dating from 1985) highlighted 3 churches: Santa María del Naranco, San Miguel de Lillo and Santa Cristina de Lena. The first two are located in Naranco, a few kms north of Oviedo, while the latter is in Lena (about 35km south). Lena is where I started my rounds. It’s a tiny, poor looking village in the middle of the quintessential Asturian landscape with mountain peaks all around and lots of trees. The church is signposted from the main road, and there are 2 parking lots. I first tried an approach from parking lot #1, but that’s a very steep climb. The second way of access was more to my liking: a wonderful path through the fields. Locals use it to walk their dogs or jog. The church has a great location on top of the hill. It is open to visitors for a small fee, except on Mondays. And I was visiting on a Monday -- so I just admired its robust exterior, took a lot of photos and tried to block out the noise from the Leon-Oviedo highway below. Via the same highway I then drove about half an hour north, to Naranco. A large parking lot and signposts suggest that this place sees quite a number of visitors. More climbing was involved here: first from the parking lot to the visitor center. The center has a couple of displays (in Spanish, English and French) that detail the history of Asturian architecture. This is where you normally pay the entrance fee too, but there is no cost for visiting on Mondays. I first went up to San Miguel de Lillo (yes, another climb of about one km). It has a similar, bulky layout as the church in Lena. Fortunately I did get inside here. The ceilings have some remnants of frescoes. The rest just looks very old! To think that this group of churches is of the same age (or even a bit later) as the splendid Byzantine Churches in Ravenna (which I visited earlier this year). The Santa María del Naranco is on the other side of the vistor center. It was built as a residential palace, and later turned into a church. It still does look more like a palace. Here it's also possible to go inside. Especially the second floor is worth seeing, with its balconies with decorated columns and exterior stairway. This was the busiest site of the three to visit, with about 40 people present. Most of them Spanish, but also a group of Japanese. The WHS got extended in 1998 with 3 monuments in Oviedo itself. I did visit Oviedo and had lunch in the city center, but my energy to track down these sites ran out. I was content with my memories of the 3 churches that I had visited in the morning, and probably even more with their wonderful locations. I visited all the 6 sites of this WHS in June 2016. I stayed for 2 nights in a hotel near Monte Naranco. The first day I visited Santa Maria del Naranco, San Miguel de Lillo and Santa Cristina de Lena. 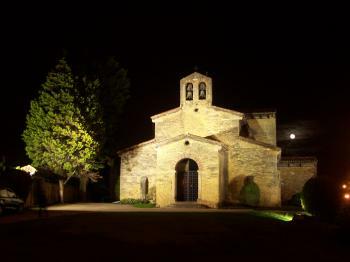 The first two can only be visited with a guided visit in Spanish and tickets can be bought at Santa Maria del Naranco. Next to these two sites there is a small information centre as these are the most visited sites being quite close to Oviedo by car/public transport. Plan ahead not to visit on Mondays as pretty much everything would be closed. Santa Maria del Naranco is mostly famous for its peculiar architecture as well as for the unique engravings and sculpted capitels. San Miguel de Lillo has a few mural painting left although most of it is damaged due to humidity and sunlight. Photography is not allowed inside this church. Don't expect elaborate paintings as these sites are quite old. Make sure to pay attention to the beautifully carved walls on the sides of the entrance which can be appreciated just before exiting as when the second door is opened for people to go out, the sunlight reveals the great detail. Next I drove just outside Pola de Lena to visit Santa Cristina de Lena. Make sure to have a GPS or else follow the signs which direct you off the highway through Lena proper. This church has the best natural setting and panorama once you arrive up the hill but at the same time beneath the hill are two huge highways. There are two ways to visit. Either via a steep walk uphill or else through a shaded path just opposite a few parking spaces. I'd recommend the latter as the old lady who looks after the church and has the key lives just next to this path. Not many people visit this site so when there are no visitors around she looks after her horses and goats and lets them roam freely around the small church. Should you opt for the uphill route she might not see you and you'll either have to call or else you will have to backtrack to where she lives. The church's interior is the most well worth viewing in my opinion as its architecture is truly unique. The intricately carved vestibule and royal tribune on different levels are well worth viewing if only for the comparison between Asturian pre-romanesque and Visigoth influences. The highlight is the presbytery elevated above floor level separated by three arches on marble columns. All three churches have beautifully carved windows, probably the best examples are those at San Miguel de Lillo, even though they are protected with a piece of glass. On the next day I focused more on the sites in Oviedo which were added later. The Fuente de Foncalada is hidden in the concrete jungle just after Cider Street while the Camara Santa together with the Cripta de Santa Leocadia are the main highlight of the Cathedral of San Salvador in Oviedo. To enter you will have to pay the rather expensive 5 euro entrance fee or 7 euros including the audio guide. The Camino Primitivo and the Camino de la Costa pass through Oviedo and it is said that who goes to Santiago but not to the Oviedo catedral, visits the servant but not the Lord. The catedral itself is not inscribed but the Camara Santa together with the Cripta de Santa Leocadia are only accessible through the catedral. There are three main things to see here. The main highlight is the Camara Santa which is up one floor to the right of the main altar. In fact it is the upper floor of the Asturian building. It houses the cathedral's main treasures: the Holy Shroud, the omnipresent Cruz de la Victoria, the Holy Ark and the Agate treasure chest. Moreover you can see the apostles carved in the columns supporting the chamber. Downstairs, through the cloister, you can visit the lower floor of the Asturian construction which is now used as the Cripta de Santa Leocadia. The highlight worth visiting though is outside towards the cemetery where you can see the exterior of both as one whole building. There are 4 metal UNESCO plaques proudly displaying this inscription. One can be found in the small cemetery, one just opposite the Fuente, one in front of Santa Maria del Naranco and one in front of San Julian de los Prados. The latter is the last site I visited while in Oviedo. It is quite a long walk away from the city centre and just beside a very busy main road. However it is worth visiting not only for its elegant exterior but mostly for the best preserved murals of the series. All in all I think that these minor sites deserve their place on the list and while visiting I couldn't help comparing this inscription with the Longobards' inscription in Italy. Both inscriptions are valid additions to the list and both have enjoyable cities or towns nearby which are worth visiting if only for the culinary delights they have on offer. In both cases, this really helped to finish off my visits with a smile and a full stomach. At the start of my trip around northern Spain I based myself in Oviedo, to enable me to see a bit of Asturian countryside and also the bulk of the sites in this inscription. My first stop was to walk up to the sites at Monte Naranco overlooking the city. I was surprised by how small the monuments actually were; there was not a huge amount of room especially inside San Miguel de Lillo. The architecture was impressive in an understated, almost crude kind of way, and there were lovely sculpted detailing in the former palace of Santa Maria. The two sites were surrounded by nice green pastures and afforded wonderful views over Oviedo, especially down to Santiago Calatrava’s striking new conference centre. They are about 3km west of the station and uphill, it took me about 35 minutes to walk there from the station but Bus 10 is probably a better option for those that don’t fancy a bit of a hike. When I visited tours were given in Spanish, but I found it fairly easy to understand the gist as I had done a bit of background reading. I walked back down into the city, accompanied by the sound of clunking cowbells in the nearby pastures and bagpipes at a local wedding. I didn’t make it down in time to see any of the interiors of the inscribed sites but did enjoy walking around and people watching on the streets of the charming old town. The Camara Santa is located inside the pleasant Cathedral, which was closed when I got there. The Basilica of San Julián de los Prados is located a short walk away from the centre on the main road heading out to Gijon. It is impressively lit up at night and makes a nice welcome to the city centre, however the busy road does somewhat destroy its ambiance. There is apparently a fine selection of Frescos inside. The final site I visited was La Foncalada located in the city centre at the end of Calle de Gascona. This is a small fountain, and decidedly unremarkable as a spectacle, but it is rather old and unique. The road on which it is situated is well worth heading to though. Calle de Gascona is full of sidrerias selling local cider. It is worth going just to watch the unique way in which it is poured, even if you don’t want to try any but you would be missing out as it is very fine. I liked Oviedo it was a charming city with some lovely nightlife, and extremely helpful tourist information service at the Bus Station. It was a nice place to be based for two nights whilst exploring Asturias. The World Heritage Site includes some very impressive monuments to the early Christian heritage of Spain and makes a very worthwhile site to visit. During two days in Oviedo I managed to visit all 6 WHSs. The Camara Santa (inside the cathedral) contains valuable jewel encrusted relics. 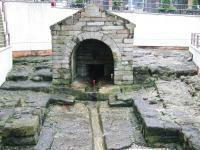 The Foncalada is an ancient spring located in a niche beneath a busy road junction. St Julian de los Prades church, 1200 years old contains well-preserved frescoes. I reached it by bus #2 from the city centre. Sta Christina's church I reached from La Cobertoria railway station where nearby there is a signboard showing several paths leading up to the church, some steeper than others. San Miguel and Sta Maria churches on Monte Naranco I reached by bus #10 to the Cruces car park, from where there are walking tracks to the respective churches. I was somewhat disappointed with the city of Oviedo since I expected more. Anyway, the churches in the nearby mountains are really beautiful. 3.5: Caspar Dechmann Antonio J.